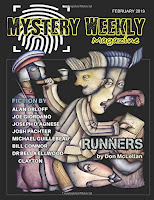 At the cutting edge of crime fiction, Mystery Weekly Magazine presents original short stories by the world’s best-known and emerging mystery writers. The stories we feature in our monthly issues span every imaginable subgenre, including cozy, police procedural, noir, whodunit, supernatural, hardboiled, humor, and historical mysteries. Evocative writing and a compelling story are the only certainty. Get ready to be surprised, challenged, and entertained--whether you enjoy the style of the Golden Age of mystery (e.g., Agatha Christie, Arthur Conan Doyle), the glorious pulp digests of the early twentieth century (e.g., Dashiell Hammett, Raymond Chandler), or contemporary masters of mystery. 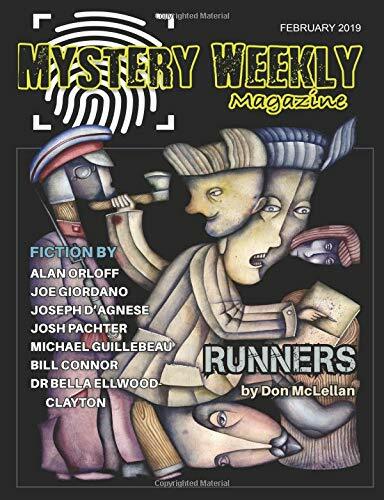 In our cover feature, “Runners” by Don McLellan, three desperate fugitives from a Soviet gulag arrive cold and hungry at a trapper's cabin high in the mountains. The old man offers food, dry clothing and directions to freedom, but then the food runs out. “Last Call At The Bar Of Invariable Length” by Josh Pachter: A man walks into a bar in a sleepy South Carolina beach town, and what happens next is no joke. “Blood Poisoning” by Joe Giordano: Laurel told her father not to get married. Now a homicide, gold-shield detective is involved. “Playdate” by Dr Bella Ellwood-Clayton: How far will a mother go to protect her daughter from bullies? In “The Word” by Bill Connor, Rennie, a homeless drunk, is coerced into helping a strange woman get rid of a killer cop. “Hello, Cupcake!” by Alan Orloff: Looking to reconnect with an old flame? Watch your step or you might get burned! In “The Smooth Joy Of One Good Step” by Michael Guillebeau. Bobby Earl's always gotten himself in trouble by living in the moment. But when a guard asks Bobby Earl to hold his rifle, he really should have thought more than one step ahead. In “The Vulnerable Rind” by Joseph D'Agnese, a young Italian carabinieri officer launches an unofficial investigation into a series of trivial break-ins at a small cheesemonger's shop in Rome, with troubling results.